Just like all we've waiting for, here are your latest GrabCar Promocodes for October 2016 from GrabPH. We'll throw in working GrabTaxi promo codes too if available. Enjoy and share it to your friends! 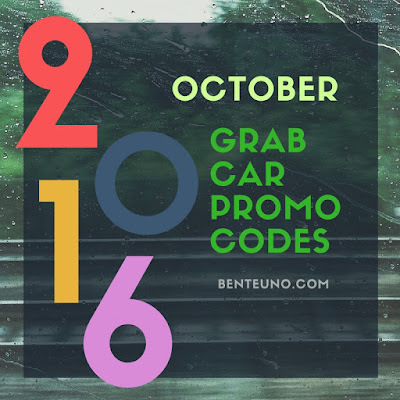 See and enjoy the list of 2016 GrabCar Promo Codes for October, updated regularly as soon as a new code is available. [Update October 29] Use GrabCar Promo Code "LONGWEEKEND" and get PHP 50.00 off on your two GrabCar rides from October 29 to November 1, valid for Manila rides. [Update October 21] Use GrabCar Promo Code "NIGHTSHIFT" and enjoy 50% discount on your 3 GrabCar rides in Manila( up to PHP200). Valid until October 25 from 9PM to 5AM only. Use GrabCar Promo Code "GRABPAYDAY" and get P100 off your 2 GrabCar rides when you book using your credit/debit card. This promo code is valid from September 30 - October 3 (Friday to Monday) for Manila users only. In support of #UAAPSeason79 Men's Basketball, Grab Philippines is inviting you to use your school's name as your GrabTaxi / GrabCar's promo code(for October 2, Sunday, until the game ends). Whoever team wins tomorrow will get an exclusive code on Monday for P100 off one ride! Valid only in Metro Manila.